Q: What are the differences in residential and commercial shade structures? A: Superior Shade manufactures commercial-quality shade structures to IBC (International Building Code) 2012 standards no matter if it's for commercial or residential use. Residential shade sails are typically available online or by awning manufacturers and typically include a canopy with a D-ring attachment. The canopy can be tensioned using hardware or other means such as rope and is secured as desired by the end user. As opposed to commercial shade structures which will require an engineered footing to support the structure. Q: Can you engineer the shade structures to meet local requirements? A: Yes, SRP Shade structures can be engineereed to meet local wind requirements upon request should they exceed the standard design. Q: What types of foundations will the shade structure require? Larger structures or structures with higher entry heights can expect to have larger foundation requirements due to the additional loads put upon the frame. Foundations for your structure can be designed to meet your preferred method of installation be it a spread footer or pier footing style. Q: What building codes apply to my structure? A: Depending on where the permitting will take place, the structure may need to meet the building code specified by either the city or the county. When engineering a structure, Superior will request information regarding the installation location of the shade structure to ensure the structure and foundations are engineered to meet local building code. Q: Will permits be needed? If so, what is the process? A: Permitting requirements are often determined by the end user. Traditionally HOAs, churches, and multi-housing applications will not require permitting unless done as part of an in-house procedure. City projects will normally require permitting. The process for this consists of obtaining stamped drawings for applying for a local permit that adheres to the required building codes at the local permitting office. Q: Where are these structures manufactured? A: Our shade structures are proudly made in the USA. Our shade manufacturing facility is located in Carrollton, Ga.
Q: What is the timeline for purchasing a shade structure? A: The answer for this can vary by the type of structure being purchased and the complexity of the design. There are two main processes that take place to create and deliver shade structures: engineering and production. Engineering Process: On custom shade orders without sealed drawings we’re currently at 2-3 weeks to produce shop drawings/BOMs and workloads for the shop. At this point in time, the order is scheduled for production based on availability on the production schedule and feedback from our vendors on lead times. The estimated shipping date will be available to allow for installation planning. Production Process: Our production schedule typically keeps a backlog of 3 weeks’ worth of orders to produce. At this time, production will require one week to build/ship so your shipping date would likely be 4-5 weeks after shops are complete. Certain orders containing custom aspects such as custom powder coat colors that carry longer lead times from our vendors may impact these dates. The simple answer is 2 to 3 weeks for engineering and 4-5 weeks for production. Q: What is the best way to optimize shade for my space? A: Keeping the entry height as low as possible and utilizing the largest shade structure that can fit in your space are two of the simplest ways to maximize shade for your area. Q: Why choose Superior for my shade needs? Q: Are fabrics fireproof or waterproof? A: Fabrics are neither fireproof nor waterproof. Alnet fabric is rated for the CAFM California Fire Marsh test for first resistance. Approximately 80% of water will shed off of a shade structure with the rest coming through as a fine mist. Q: How long does the fabric last? A: Superior Shade fabrics carry a ten-year limited manufacturer’s warranty from the date of delivery against failure from significant fading, deterioration, breakdown, outdoor heat, cold, or discoloration. Should the fabric need to be replaced under the warranty, Superior Shade will manufacture and ship a new fabric at no charge for the first six years, thereafter pro-rated at 18% per annum over the last four years. Q: What kind of maintenance does the fabric require? A: The canopy itself requires very little maintenance over the course of its life. The most important aspect of maintenance is ensuring the canopy cable remains properly tensioned over time. This may require the replacement of a cable every 5 years. Additionally, northern and coastal customers should be aware of inclement weather such as snow and hurricanes and ensure the canopy has been removed. Q: What are the wind loads? A: Standard shade structures are engineered and designed to withstand 75mph sustained winds and 90mph winds for 3-second gusts. Our structures can be engineered to meet higher wind loads upon request. 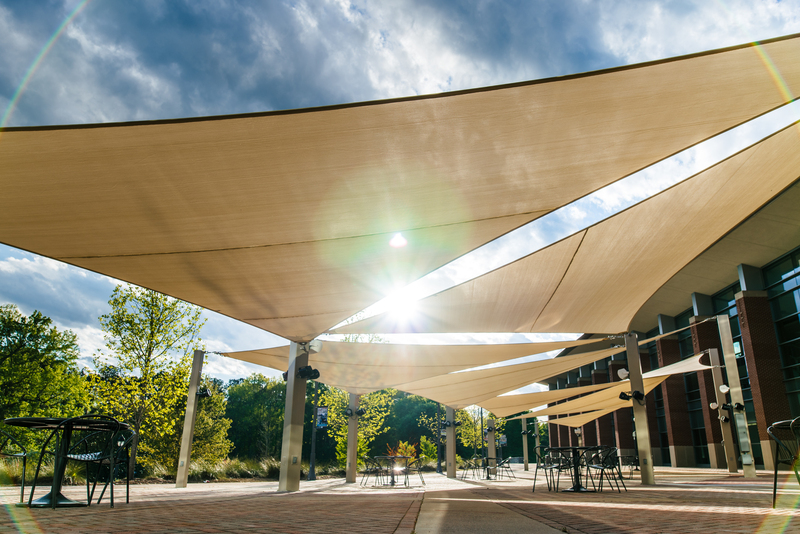 Q: Do your shade structures protect against harmful UV rays? A: This varies by color and fabric type. See our Shade Color Options page for additional information.